We use the most advanced water damage detection technology available. When it comes to assessing and restoring a water damage call the pros at 416-236-0660. We are highly trained at water damage assessments and flood cleanup procedures. Just because you can see the water damage it doesn't mean it isn't there. We can determine the extent of water damage and provide trustworthy advice on how to execute an efficient flood cleanup. We are the best water damage contractors in the Toronto Mississauga Brampton area. Many people visit Toronto and its surrounding areas every year for its world class attractions and multicultural cuisine. When a water emergency threatens even a single room of your hotel, adjacent rooms could also be affected by water damage. Your operations and customer satisfaction depend on resolving sudden damages as quickly as possible. 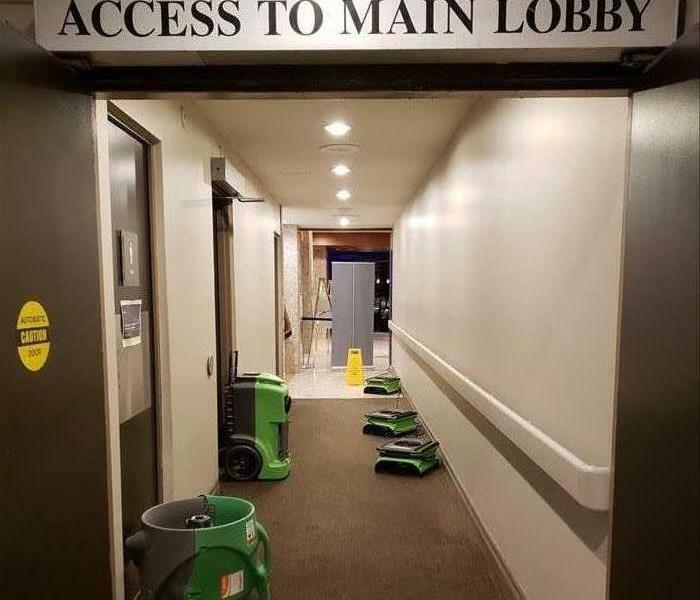 At SERVPRO we have the proper training and experience to determine the extent of water damage in your hotel and recommend steps for a restoration process that will minimize disruption to your business. We know these events are unexpected and whether it's your home or business, you want it back in order as soon as possible. SERVPRO is "faster to any size disaster" and we are always here to help! There’s never a good time for flooding or water damage to impact your company or commercial property. Every hour spent cleaning up is an hour of lost revenue and productivity. Commercial water damages can also present major disruption to landlords, tenants and their businesses. 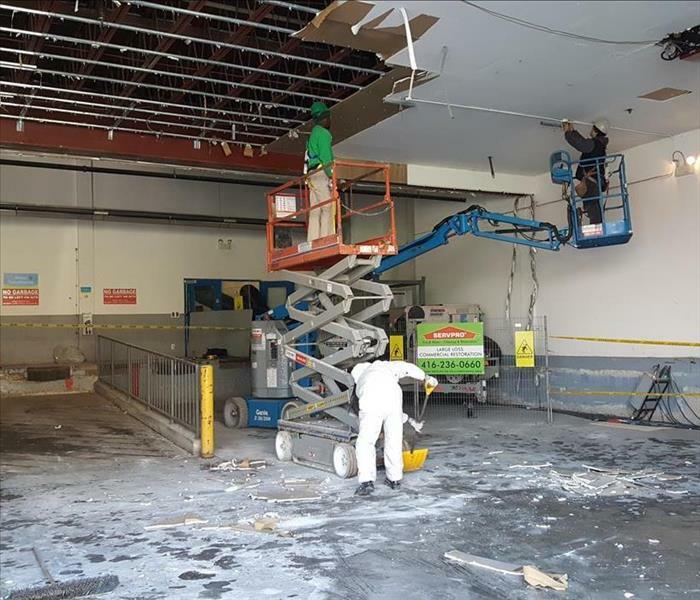 If an emergency arises at your business or commercial property, remember that SERVPRO is "faster to any size disaster" and we are always here to help! Protecting kitchen cabinets and countertop at a recent commercial/condo water damage claim in Vaughan due to dishwasher malfunction. At SERVPRO we treat each home or business like it is our own! SERVPRO specializes in restoring furniture and personal property damaged by fire or water. 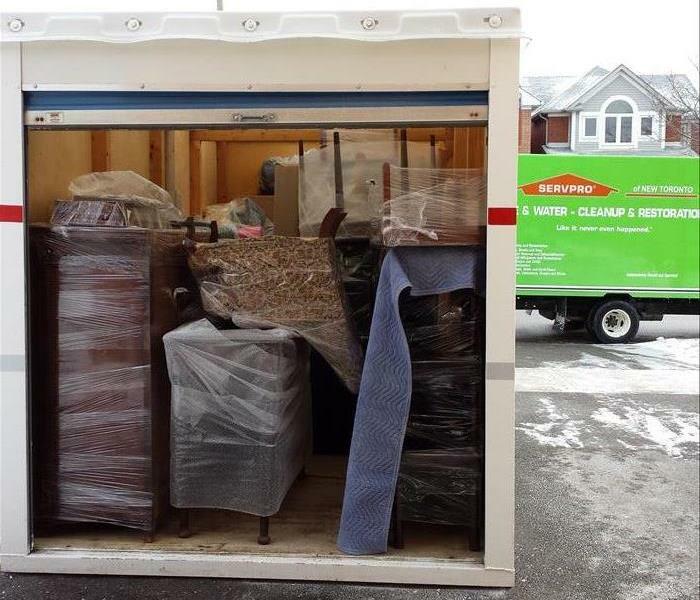 If your home requires extensive restoration or cleaning due to fire damage or water damage, SERVPRO offers contents packing, move-out and off-site storage services. SERVPRO will conduct a detailed inventory of your personal belongings, including digital photos, videos and in some instances even bar coding. Learn more about contents handling and restoration here. Don't let your pipes freeze! SERVPRO on the site of a flooded basement in Toronto due to burst pipe. If you have a frozen pipe, don't panic! Just because they're frozen doesn't mean they've already burst (yet). Learn more about water damage and flooding emergency tips here. 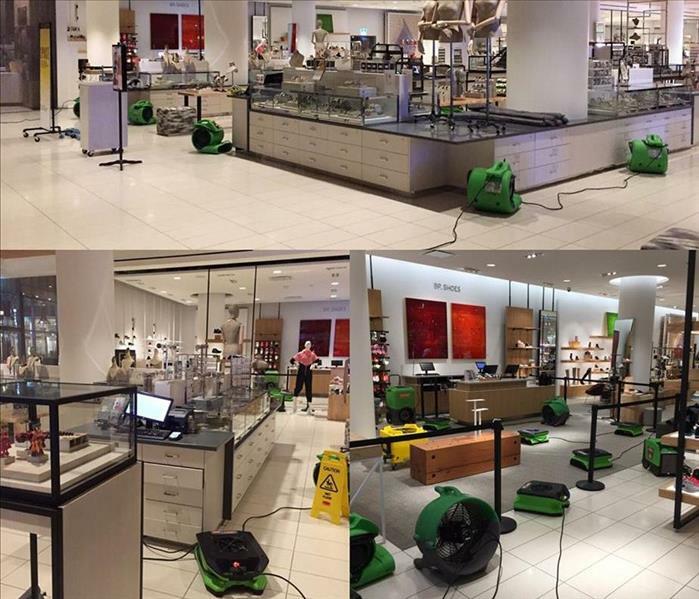 SERVPRO on the site of a flooded department store in Toronto. When you need to get back to business quickly, call the team that is faster to any size disaster. Remember that SERVPRO is here to help. Within 1 hour from notice of loss a SERVPRO representative will arrive on site to arrange service. At SERVPRO our goal is to restore versus replace which means saving you time, money and disruption by drying building materials (drywall, carpet, hardwood flooring) in-place. Learn more about SERVPRO's advanced drying technologies and techniques here. 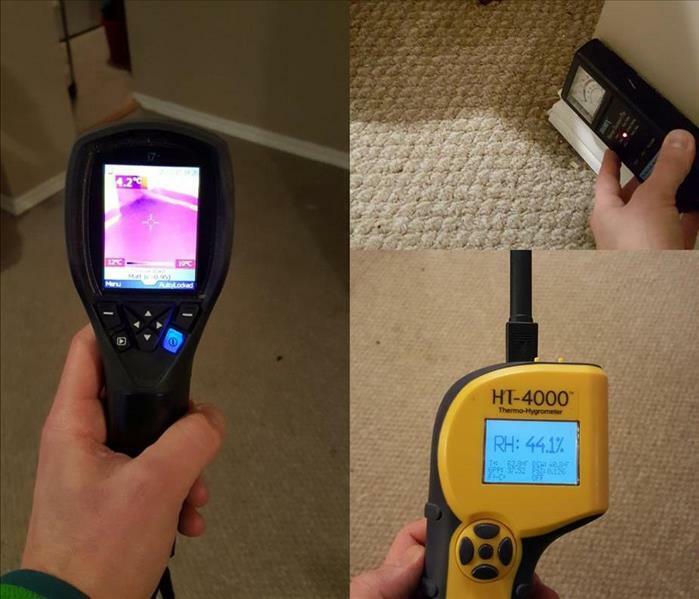 SERVPRO provides free inspections and free estimates across the Greater Toronto Area. Our technicians follow IICRC standards and best practices in water restoration, fire restoration, mould remediation, asbestos abatement and other cleaning and restoration guidelines. At SERVPRO our technicians are highly trained and certified water damage restorers and we have the proper tools and equipment to inspect your water damage. At SERVPRO we prefer to restore versus replace. We have a specialty drying systems to save water damaged hardwood flooring as well as ceilings, subfloors, tile, bulkheads, plaster walls and even concrete. This high-pressure ventilating system is used to remove trapped moisture from building materials or difficult to reach areas. Learn more about the drying and dehumidification process here. Learn more about the fire damage restoration process here.